Christmas is just around the corner, which could mean that the demand for Christmas greeting cards, party invitations, and posters will increase. While we can always go out and buy these in bookstores, we can also make some for ourselves by using downloadable illustration design templates that are available online. This is also very useful for those graphic artists in need of illustrations to make these greeting cards and invitations to be able to keep up with the demands. 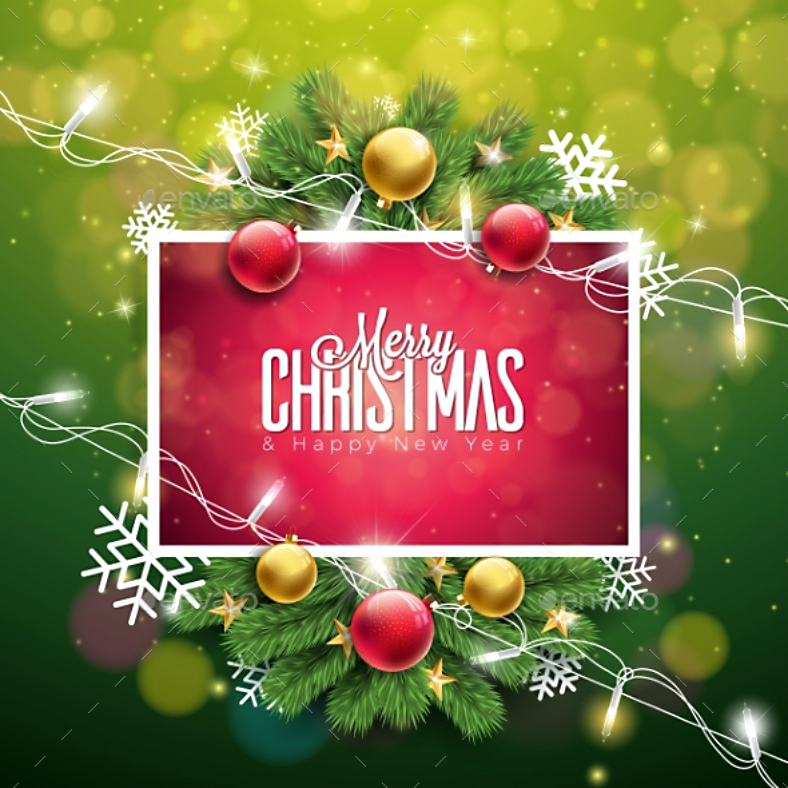 If you are one of those who are in need of easy to download Christmas illustration designs, then you don’t need to go past this page since we have gathered the best ones here for you. This way, we are actually helping you save a lot of time in having to look for visually stunning illustrations for your projects. Go ahead and scroll down to see some of the best Christmas illustration designs that you can find on the Internet. Let’s start off this list with this adorable Christmas illustration that shows an image of a snowman with its arms spread out as if asking for a warm hug. Come to think of it, we’ll never know what’s inside a snowman’s mind after it gets put up. After being left outside, who knows, it may even appreciate being hugged by people. But putting that aside, let’s talk more about the graphic illustration design above. Aside from the snowman, you can also find some presents on the bottom right-hand corner, hung Christmas stockings on the upper left, and a Christmas sign on the upper right. 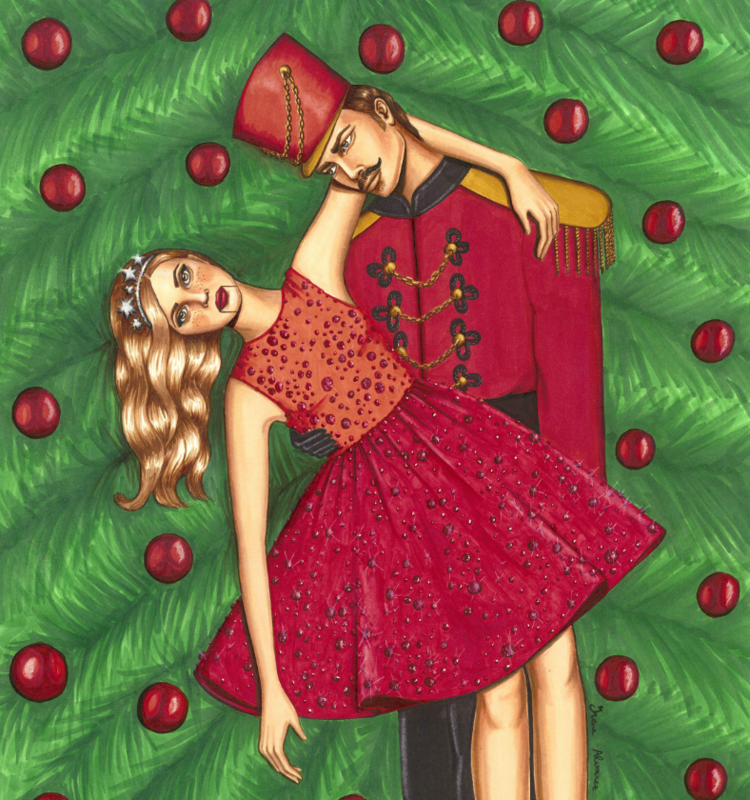 Check out another adorable Christmas illustration design that you can barely take for granted. 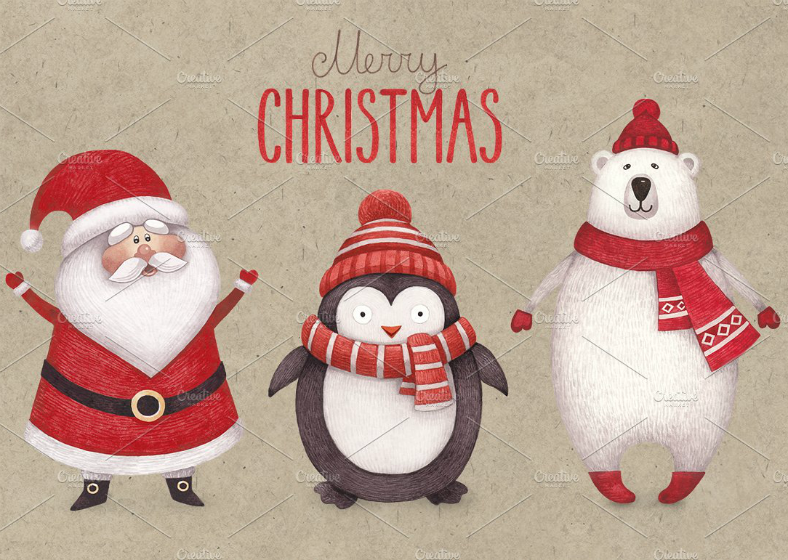 These Christmas illustrations shows us the man himself, Santa Claus, and he’s brought two of his friends with him, a penguin and a polar bear. Indeed, this illustration design is cute just the way it is and it no longer needs additional elements since there is no way it can get any better than this. If you were to ask us, we would say that your $12.00 will be worth every penny if you download this Christmas illustration. During the Christmas season, it is very common to find Christmas lights and other kinds of decors being placed both inside and outside homes, work places, schools, and many establishments. This is to make the season bright, livelier, and joyful. After all, Christmas does call for a celebration, doesn’t it? For the illustration design shown above, it contains Christmas lights around the corners, as well as some bokeh and lens flare effects from those lights. 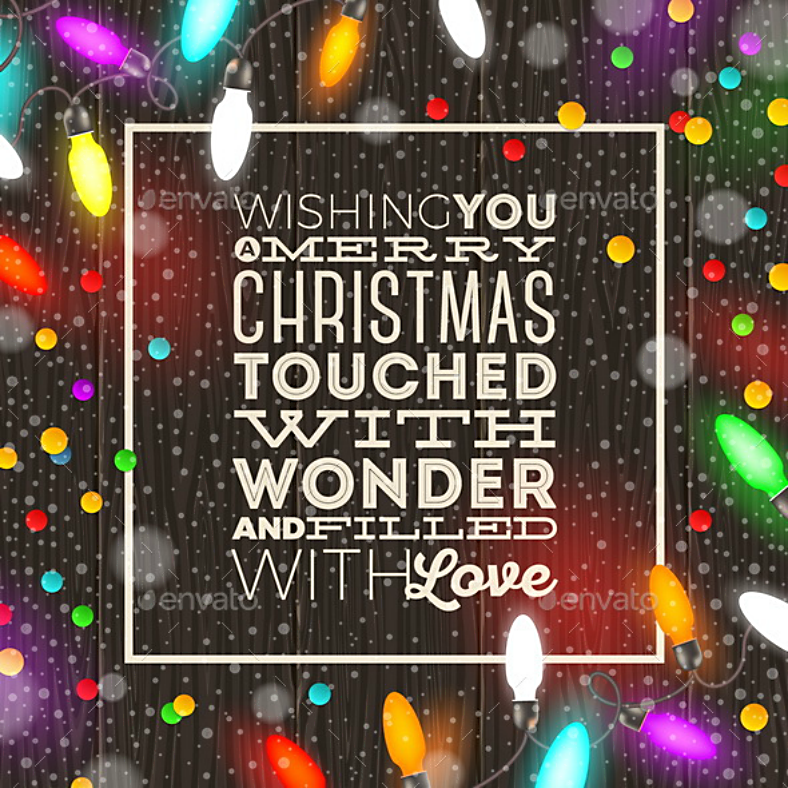 While this Christmas template design leans more toward simplicity with its focus on text, the added Christmas lights help in further enhancing the level of appeal of this illustration design. 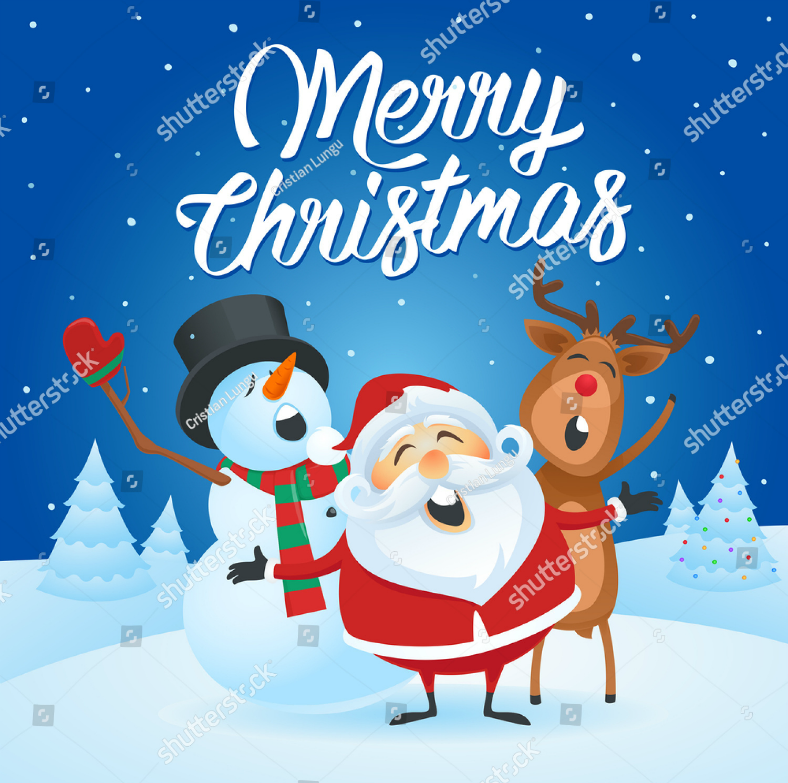 By now, you have probably noticed that the Christmas illustration designs shown on this list contain cute and cartoonish elements of Christmas character, which should always be the case. As mentioned in the previous sample, Christmas itself is a beautiful event that calls for a celebration, and what better way can this optimism be shown than with an adorable imagery. 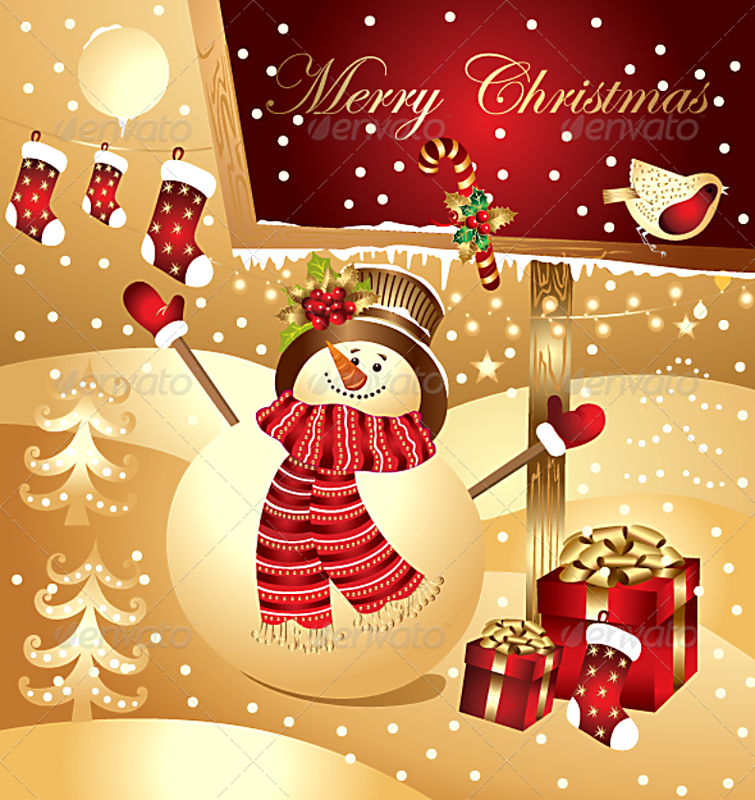 The illustration design above shows Santa Claus, Frosty the snowman, and Rudolph the red-nosed reindeer singing and caroling to the person reading the card. 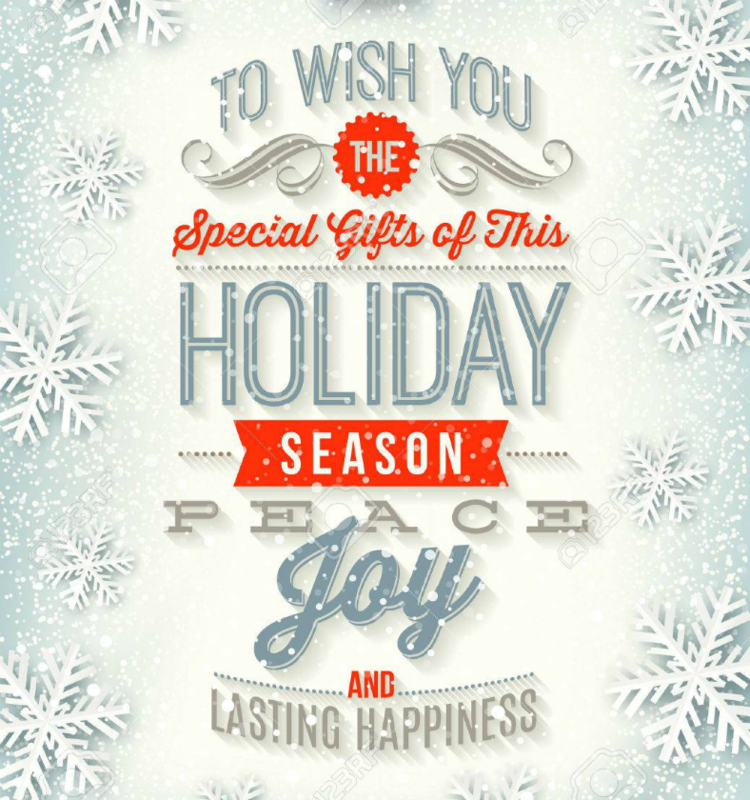 This Christmas illustration design is indeed perfect for spreading the positive holiday spirit. Before we start to look at the Christmas illustration design above, we just want to ask you a very simple question, “Who would you rather be with during Christmas eve?” It only makes perfect sense that all of us would rather be with our respective families. Sure, there may be times when we cannot force ourselves to be with them during these times, and it may either be due to work, long-distance travels, and other unforeseen events, but when given the chance, of course we would rather be with our families during Christmas. 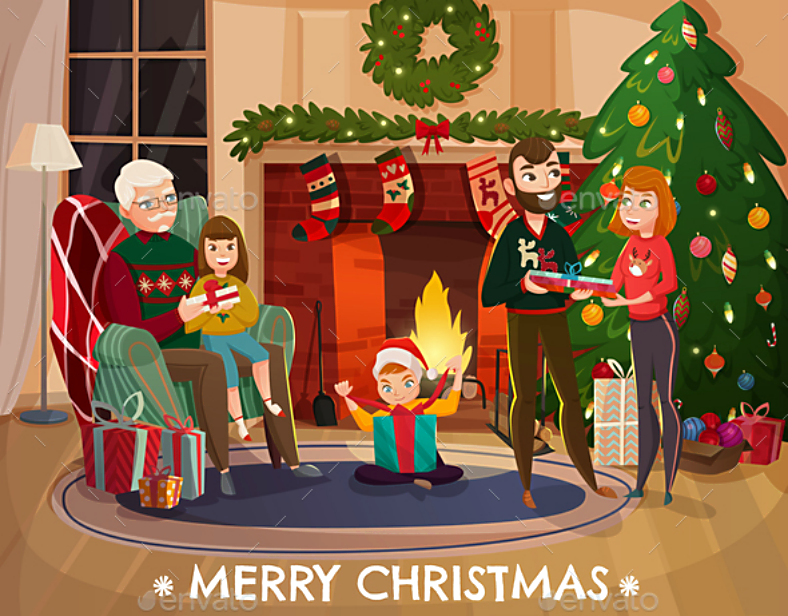 Now to the illustration, if you can see the image above, it shows us a family that consists of a father, mother, a son, daughter, and a grandparent gathered around the fireplace to celebrate Christmas. Whether you are with your family for Christmas or not, this design may be appropriate when printed on holiday card designs since it reminds people of how valuable families are that as much as possible, you should always spend time with them during special occasions. In connection with the previous illustration design, since we have already mentioned regarding not being able to spend Christmas with the family due to uncontrollable events, the design above may be what you are looking for. This illustration design bears an image of a girl celebrating Christmas by herself, and from the way this is being presented, it shows that the girl is enjoying herself even though her family is far from her. If you are in this situation, then use this design to show to your parents that you are doing well. 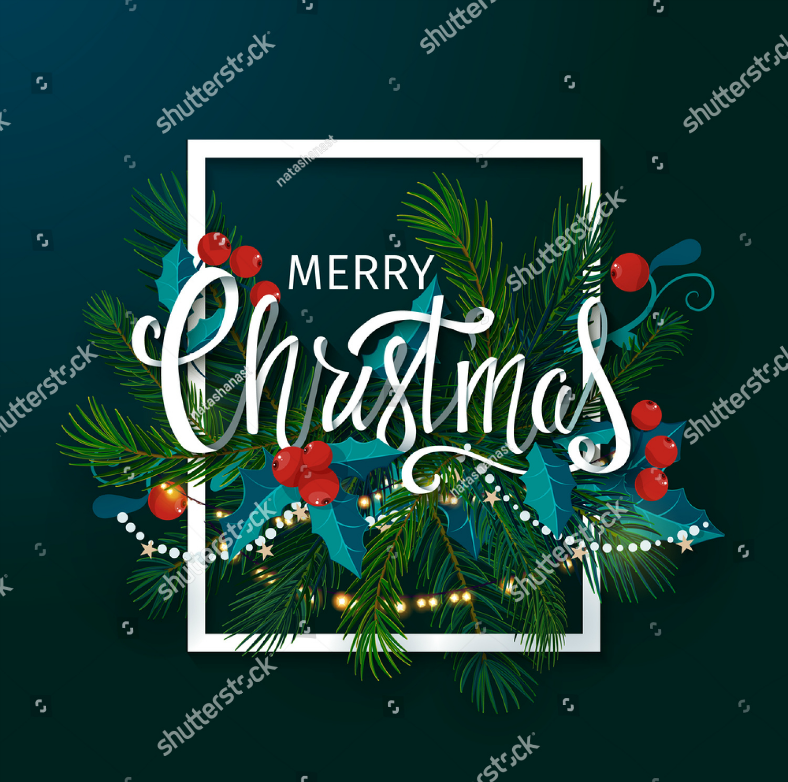 Check out the colorful Christmas illustration design above, which focuses on Christmas decorations that include fir leaves, Christmas balls, faux snowflakes, and Christmas lights. These decorations are placed around a pink greeting card and over a green background, which is appropriate for the season. And on the foreground are bokeh effects resulting from the Christmas lights. 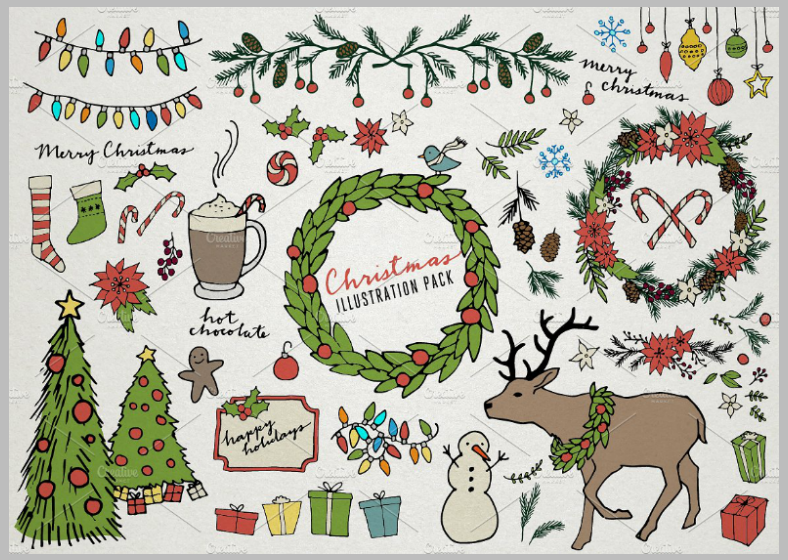 For those looking for an entire set of Christmas-themed illustrations that you can use individually, the illustration pack shown above may be what you are looking for. This pack includes illustrations of a Christmas tree, a snowman, Christmas lights, boxes of presents, candy canes, and even a reindeer. What makes this design even more interesting is the fact that they look like they were illustrated by hand, and with its low contrast, they also appear to be vintage-themed. All of us have probably heard the song “Blue Christmas” by Elvis Presley in which the first line in the song goes “I’ll have a blue Christmas without you.” While the song actually refers to a person’s foreseen emotional state if they are not with their respective loved ones during Christmas, the blue-themed Christmas illustration above says otherwise. The design actually illustrates a snowy scenery of a town during the Christmas Eve, and the row of houses on the bottom show illuminated windows. Here is another Christmas illustration that primarily focuses on Christmas decorations which include fir leaves and shrubs of mistletoe. On the upper portion of these elements is the typography that indicates the occasion, and this text is written using a rather artistic variation of the script font. The background of this design effectively compliments the rest of the elements with its gradient blue-green theme. Snow globes are commonly seen as souvenirs, gifts, or even used as decorations during the Christmas season. The reason why they are referred to as snow globes is that they are in a shape of a globe, and that when shaken, the glitters inside become scattered resembling an actual snowfall. 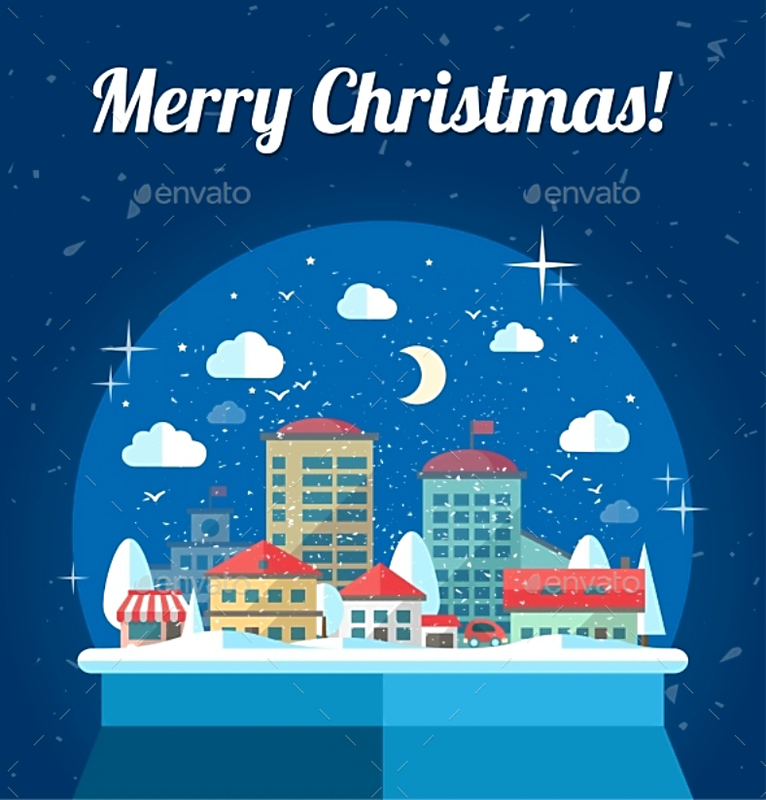 Check out the symbolic yet appropriate Christmas illustration design shown above, which bears a flat image of a town inside a snow globe. Behind the image of the snow globe is a blue background with some added elements scattered all over it to enhance the level of appeal of the illustration. 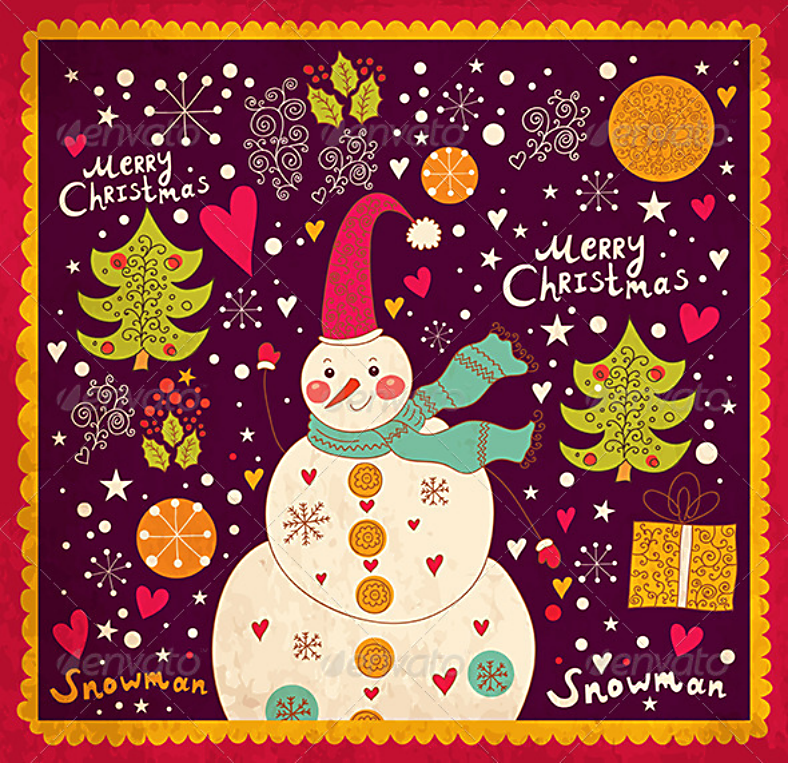 Now for another Christmas illustration that bears a cute illustration of a snowman surrounded by various elements. The elements surrounding the snowman include some text, Christmas trees, boxes of presents, heart signs, snowflake illustrations, and many more. This illustration design will definitely look good when printed on Christmas greeting cards or Christmas party invitations. Christmas “is the season to be jolly, falala lala, lala lala.” But at the same time, Christmas is also the season of peace, joy, and everlasting happiness. This occasion definitely brings out our inner child, which is something that we tend to neglect for the entire duration of the year. But during Christmas, it’s all about positivity, which is something that can be seen from the illustration above. 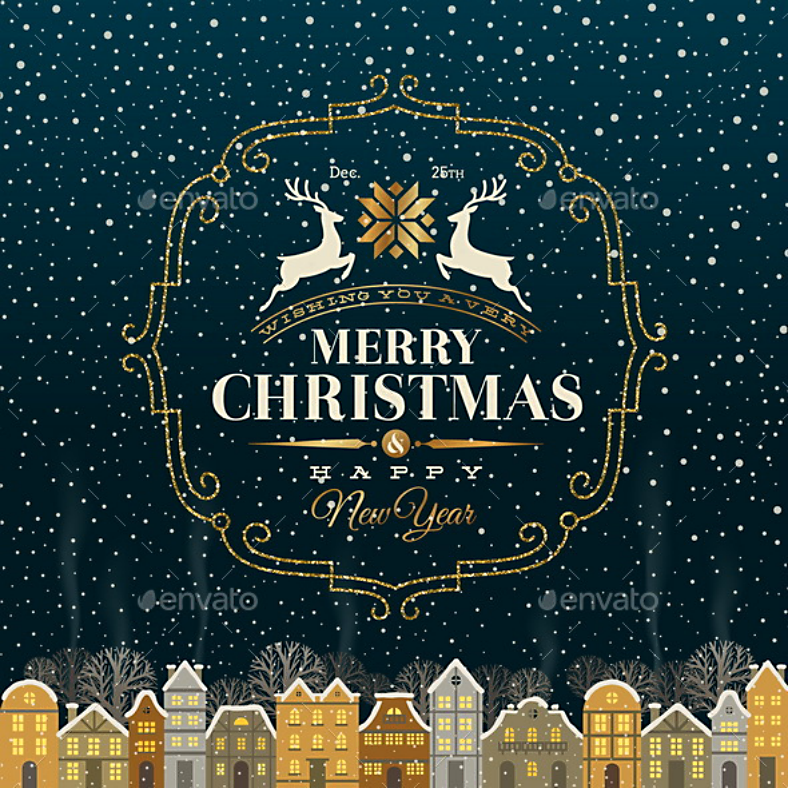 This illustration design shows a white Christmas filled with snowflake clipart and bright-colored elements, which definitely helps in influencing its audience to get in touch with the kid inside them. 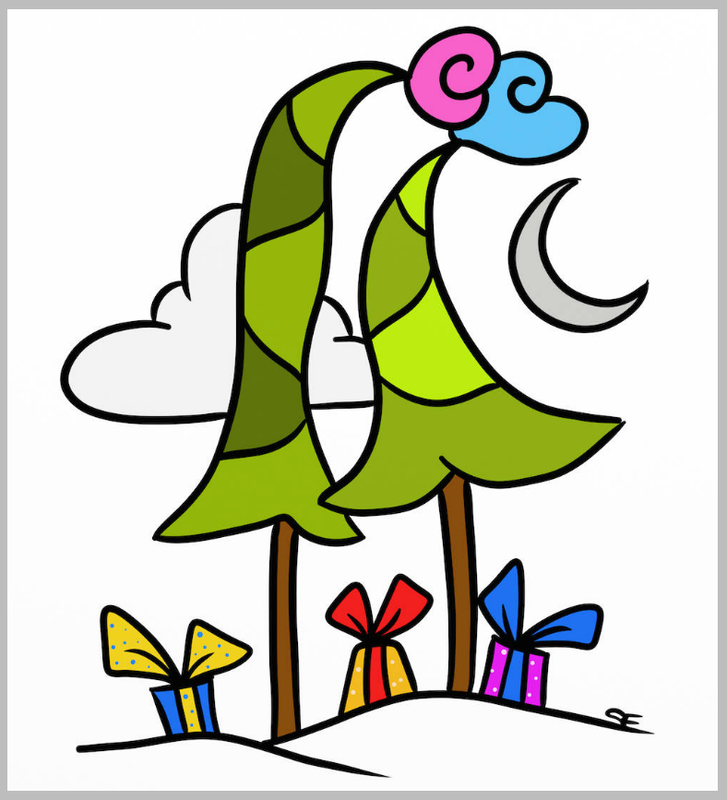 Lastly, here is a Christmas illustration that appears to resemble the art style of Dr. Seuss, the cartoonist, animator, and artist best known for creating characters that include The Grinch, The Cat in the Hat, and The Lorax. With regards to the art style, we are not referring to the actual characters in those books, but rather the way their backdrops are illustrated, the use of colors and curves, which can be seen on the design above. This flat illustration shows a pair of pine trees that are slightly curled up at its tips, and three gift boxes placed below them. For its background, it simply shows a single cloud and a crescent moon over a solid white surface. Now that you have reached the end of this article, we would like to express our gratitude to you for taking the time in looking through our collection of beautiful and creative Christmas illustrations. All this were created by some of today’s most imaginative and talented graphic artists, and were definitely made wholeheartedly. We guarantee that these illustrations have qualities that will never fail to impress. For its format, these illustrations are made using vector graphics, and as long as you have the appropriate software for editing vector files, you will not have any problem with these designs. Vectors tend to be easily workable when compared to raster graphics, and this is because they are not made with pixel blocks. Lastly, these vector illustrations can be easily downloaded for a very reasonable fee. With these affordable, easy to download, and easy to edit Christmas illustrations gathered for your convenience, why go someplace else? Download yours from our website now.